Six months after the killing of dissident Saudi journalist Jamal Khashoggi, the U.S. has decided to bar 16 Saudis related to the case from entering the country. A statement released by the State Department listed the 16 individuals and said that they had been designated as unable to enter the U.S. under the Department of State, Foreign Operations and Related Programs Appropriations Act. The section in question "provides that, in cases where the Secretary of State has credible information that officials of foreign governments have been involved in significant corruption or gross violations of human rights, those individuals and their immediate family members are ineligible for entry into the United States." "The law requires the Secretary of State to publicly or privately designate such officials and their immediate family members," it adds. The State Department previously revoked the visas of nearly two dozen Saudi officials and froze the assets of 17 others. Among the 16 individuals are Saud al-Qahtani, a former adviser to the Saudi royal court who Turkey also issued an arrest warrant for, and Maher Mutreb, a security official who was close with Crown Prince Mohammed bin Salman (MBS) and who is suspected of leading the team that killed Khashoggi. Also blacklisted is Dr. Salah Tubaigy, the forensic expert whose reports have pointed to the dismemberment of Khashoggi's body. Khashoggi was killed in the kingdom's Istanbul Consulate on Oct. 2, 2018 by a team of 15, consisting of Saudi officials who arrived in Turkey for his murder and a cover-up team also in charge of dismembering Khashoggi's body. Publishing an article on the case last month entitled "It's been six months since Jamal Khashoggi's murder, and Trump has done nothing," The Washington Post urged U.S. President Donald Trump to take action on the issue. "The dedicated professionals in our intelligence services have done their jobs. 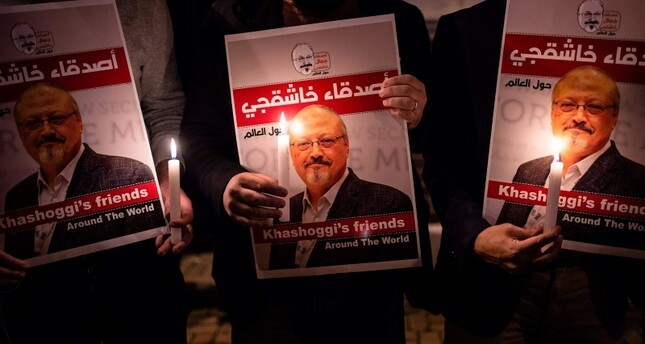 They investigated swiftly and thoroughly, concluding, with high confidence, that the crown prince was indeed behind Khashoggi's killing," the article said, referring to a CIA report. The CIA concluded in October that MBS ordered the assassination of Khashoggi. However, Trump disputed the CIA report and told reporters: "The CIA points it both ways. Maybe he did, maybe he didn't," a phrase he had used in a controversial statement released on the incident. When the reporter asked who should be held responsible for the killing, Trump responded, "Maybe the world should be held accountable 'cause the world is a vicious place." After weeks of denying any involvement in the crime, Saudi Arabia later admitted that Khashoggi had been killed inside the consulate but denied that the royal family and the crown prince had any prior knowledge of or responsibility for Khashoggi's killing. The incident was blamed on lower-level officials, including five that are now facing the death penalty over their involvement; the kingdom has indicated 21 people are officially involved in the case.